Glossary of Code Terms. Use this in reading the IBC and other codes. 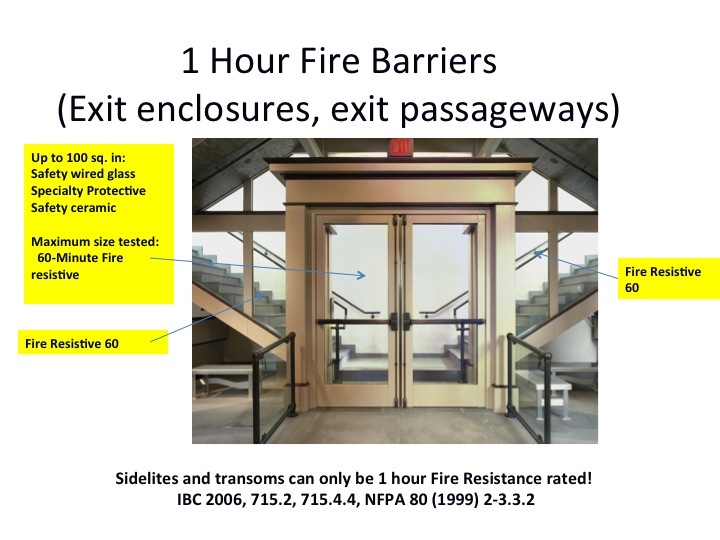 Look below to find definitions for various terms used in the codes, such as exit access, fire wall, fire window assembly, fire resistance rating, and fire protection rating. CORRIDOR – An enclosed exit access component that defines and provides path of egress travel. EXIT ACCESS – That portion of a means of egress system that leads from any occupied portion of a building or structure to an exit. EXIT ACCESS DOORWAY – A door or access point along the path of egress travel from an occupied room, area or space where the path of egress enters an intervening room, corridor, exit access stair or exit access ramp. EXIT ACCESS RAMP – An interior ramp that is not a required interior exit ramp. EXIT ACCESS STAIRWAY – An interior stairway that is not a required interior exit stairway. EXIT PASSAGEWAY – An exit component that is separated from other interior spaces of a building or structure by fire-resistance-rated construction and opening protectives, and provides for a protected path of egress travel in a horizontal direction to an exit or to the exit discharge. FIRE BARRIER – A fire-resistance-rated wall assembly of materials designed to restrict the spread of fire in which continuity is maintained. FIRE DOOR – The door component of a fire door assembly. FIRE DOOR ASSEMBLY – Any combination of a fire door, frame, hardware and other accessories that together provide a specific degree of fire protection to the opening. FIRE PARTITION – A vertical assembly of materials designed to restrict the spread of fire in which openings are protected. FIRE PROTECTION RATING – The period of time that an opening protective will maintain the ability to confine a fire as determined by tests prescribed in Section 715. Ratings are stated in hours or minutes. FIRE-RATED GLAZING – Glazing with either a fire protection rating or a fire-resistance rating. FIRE-RESISTANCE – The property of materials or their assemblies that prevents or retards the passage of excessive heat, hot gases or flames under conditions of use. FIRE-RESISTANCE RATING – The period of time a building element, component or assembly maintains the ability to confine a fire, continues to perform a given structural function, or both, as determined by the tests, or the methods based on tests, prescribed in Section 703. FIRE WALL – A fire-resistance-rated wall having protected openings, which restricts the spread of fire and extends continuously from the foundation to or through the roof, with sufficient structural stability under fire conditions to allow collapse of construction on either side without collapse of the wall. FIRE WINDOW ASSEMBLY – A window constructed and glazed to give protection against the passage of fire. INTERIOR EXIT RAMP – An exit component that serves to meet one or more means of egress design requirements, such as required number of exits or exit access travel distance, and provides for a protected path of egress travel to the exit discharge or public way. INTERIOR EXIT STAIRWAY – An exit component that serves to meet one or more means of egress design requirements, such as required number of exits or exit access travel distance, and provides for a protected path of egress travel to the exit discharge or public way. SHAFT – An enclosed space extending through one or more stories of a building, connecting vertical openings in successive floors, or floors and roof. SHAFT ENCLOSURE – The walls or construction forming the boundaries of a shaft. SMOKE BARRIER – A continuous membrane, either vertical or horizontal, such as wall, floor or ceiling assembly, that is designed and constructed to restrict the movement of smoke.